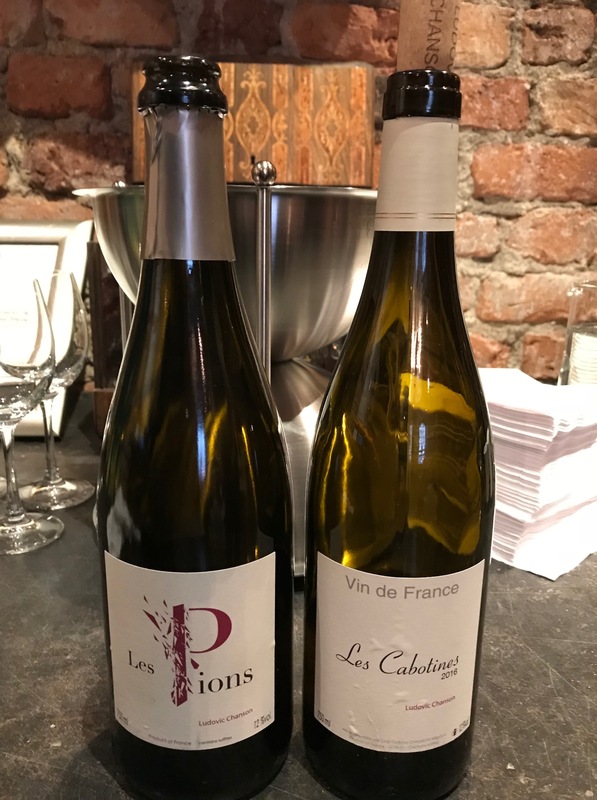 In June I tasted two Ludovic Chanson wines sold in Sweden by Caviste, both 2016s. The Ludovic Chanson wines usually originate from the Montlous-sur-Loire appellation in the Loire Valley and are then made exclusively using Chenin Blanc grapes, just as their across-the-river neighbour Vouvray. Last time I blogged about them, some 3.5 years ago, this was the case. This release diverged from that norm, because it was from the 2016 vintage. Frost in late April 2016 resulted in big losses in the Loire Valley. (The problem was not exclusive to the Loire Valley; Chablis and the rest of Burgundy suffered similar problems.) Montlouis-sur-Loire was hit particularly hard, and in the end very little was harvested there in 2016. Ludovic Chanson then decided to produce two wines using bought-in grapes from other areas, one sparkling and one still. Chenin Blanc for both wines was sourced from Azay-le-Rideau a little further to the west. Both wines also include Gros Manseng from the southwest of France, and the still wine also some Chardonnay from the Southwest. This blend meant that the wines had to be designated Vin de France. Vin de France Pétillant Naturel, i.e., a sparkling wine, 50% Chenin Blanc and 50% Gros Manseng from the 2016 vintage. Nose with ripe red apple with some winter apples and dried fruit, a slightly flowery note. The nose is very Chenin-styled but is rather developed for a young wine. Dry on the palate (the production method means that the wine is fermented fully dry and doesn’t have any sugar/dosage added) but with a fruity attack, winter apples, prominent spice notes, slightly oily, good acidity, and a spicy aftertaste. A sparkling wine with a food-oriented profile, mostly Chenin-styled but almost with some impression of Pinot Gris on the palate. Drinks well now, 87 p.
Les Pions shows more developed notes and more dried fruit, compared to the still wine. Vin de France, 50% Chenin Blanc, 40% Gros Manseng, and 10% Chardonnay. Raised in oak barrels (no new oak) for 11 months. Fruity nose with ripe apples, white currants, melons, rather flowery with discrete perfume notes. Dry palate with a fruity attack, ripe apples, white currants, melons, good substance on the palate, medium+ acidity, some spice notes, and a fruity aftertaste. Drinks well now, 87-88 p.
A more fruity profile than the sparkling wine. Comes across as slightly younger but should probably be consumed young. This entry was posted in 2016, Chenin Blanc, France, Gros Manseng, Loire. Bookmark the permalink.